AutoNation CEO Mike Jackson says the shift to a transactional, homegrown website was years in the making. The IT department has grown from two dozen people to 250. “Our sales have gone through the roof,” he said. 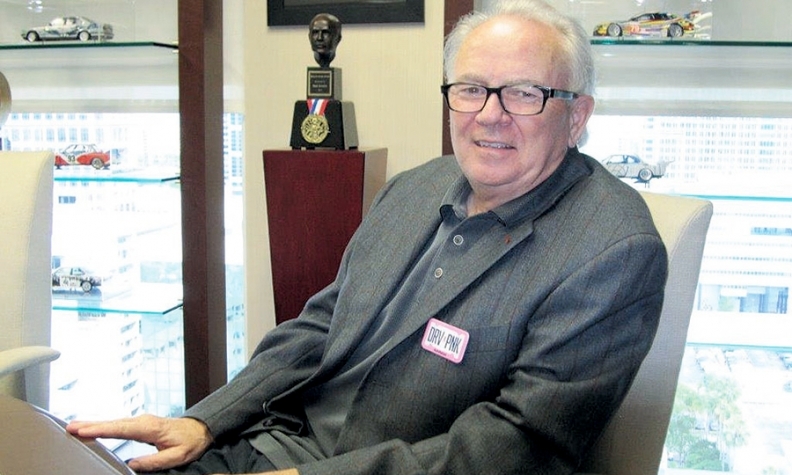 FORT LAUDERDALE, Fla. -- AutoNation CEO Mike Jackson says he's starting to see consistent payoff from the $200 million technology and branding bet the company placed on using its own website to sell cars online rather than third-party shop-ping sites. Eighteen months ago, AutoNation was on course to derive 20 percent of its vehicle sales from TrueCar, Costco and other third parties, Jackson said during a sit-down in his office here. Its own website, autonation.com, was generating just 10 percent of sales. But with major improvements to the website, including allowing a customer to do the bulk of a transaction online, that's reversed. Today, the website and its AutoNation Express transactional tools account for more than 20 percent of AutoNation sales, with third parties down to about 9 percent. Moreover, AutoNation has cut altogether two of the lowest-profit lead generators, TrueCar and Costco, the ouster of the former coming in July through a loud and public exchange with TrueCar ex-CEO Scott Painter. "The third-party sites that were looking more to get in between us and our customers and leverage the situation to extract a ransom from us had to go," Jackson said. Jackson said "the pivot" from an emphasis on third-party lead generation to a transactional, homegrown website with aggressive brand marketing was years in the making. The push started on the foundation of AutoNation's own information technology department, which over the years developed and improved such sophisticated store software as inventory management and customer relationship management tools. The latter helps stores promote products and follow up with consumers on sales and service. From two dozen people two years ago, AutoNation has built an IT department of 250 people, with half writing software code, as well as an 80-person digital marketing staff at the company's 17-story headquarters in downtown Fort Lauderdale. The fruits can be seen at autonation.com, where 100,000 vehicles at the 253 stores are listed in inventory at any given time. AutoNation sold 29,046 new vehicles at retail in September, up 21 percent year over year. Its website visits were up 74 percent from September 2013. AutoNation calls the transactional tools on the site AutoNation Express, which features five steps called "5 & Drive." First, the shopper selects a vehicle, then has it automatically put aside at the store of his or her choice. The third step is to negotiate a price with the help of a detailed payment calculator to determine monthly payments. The fourth step is a tool that values a customer's trade-in through a 30-plus question survey that results in a guaranteed price certificate subject to store verification. And finally, a fast paper-signing and delivery is arranged for easy in-and-out. Additional features are in the works, said Famous Rhodes, AutoNation's vice president of digital and customer experience. In July, AutoNation began piloting at its five stores in Sacramento, Calif., a program that allows customers with a trade-in certificate to get a check on the spot instead of waiting the traditional three to seven days to get paid, Rhodes said. This month, AutoNation's 17 Denver stores began piloting a new AutoNation Express feature called Custom Payments that allows shoppers to view monthly payment calculations on the same screen whether the shopper opts to buy a vehicle or lease it. The features will be rolled out to all AutoNation stores after they are proved in their pilots, he said. And in December, a tool called My AutoNation Dash is expected to be ready. It will be a shopper's custom dashboard to store shopping data over multiple online sessions, providing convenience for the customer. Jackson said AutoNation waited until 24 months ago to get really serious about building its own transactional web presence because he believed that third-party vendors and the automakers themselves would have provided robust products for his stores to use. But in the absence of those outside developments, leadership made the decision to plunge into the technology with a commitment of $200 million for development and marketing. "We went all in. We burned all the ships," Jackson said. "Imagine, that during the pivot, we fired Costco, broke with TrueCar, instituted our customer-friendly ... recall policy -- which disrupts 5 to10 percent of our inventory on any given day -- and our sales have gone through the roof."